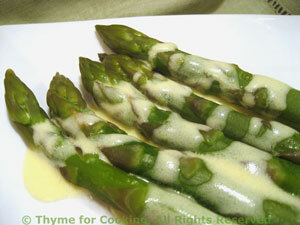 Asparagus with Lemon Sauce, Thyme for Cooking spring vegetables. The Lemon Sauce is surprisingly similar in taste and consistency to Hollandaise.... Needless to say, much lower in fat and calories. But the taste.... Lay white asparagus on the counter while peeling to prevent them from breaking. Lower heat and cook just until done, 6 - 8 minutes, longer for white. When done drain and put into a serving dish, drizzle with Lemon Sauce and serve, hot or cold.